Arachnids have roots in the Silurian Period, in the form of aquatic, scorpionlike creatures called eurypterids, or "sea scorpions." The eurypterids are an extinct group of arthropods that lived primarily in brackish freshwater environments and lagoons. Most species were small, but some spectacular examples such as Pterygotus routinely reached lengths of more than six feet (1.8 m). 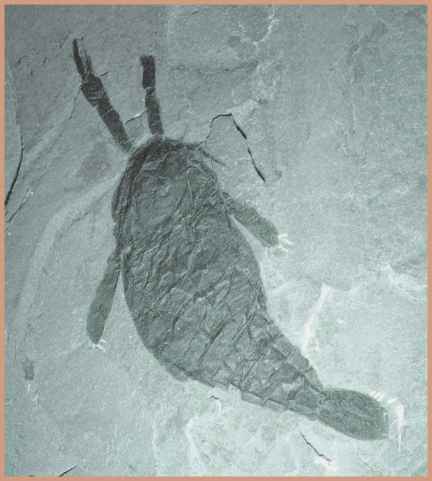 Larger still was a fossil specimen of the eurypterid Jaekelopterus (Early Devonian, Germany) described in 2007. Based on a single claw, this sea scorpion reached an enormous length of 8.3 feet (2.5 m), the largest known arthropod of all. The scorpionlike eurypterid Pterygotus from the Early Devonian of Germany reached lengths of six feet (1.8 m) and was a menace to early fish. that may have allowed them to move about in shallows like modern-day crabs. Scorpions are members of the arachnid group Scorpiones. The relationship between the first terrestrial arachnids and the euryp-terids is not entirely clear. The first true scorpions, such as Paleo-phonus from the Silurian of Sweden, retained gills like those in the eurypterids but had other features that appear to have developed separately from the sea scorpions. In the Middle Paleozoic, gigantic species of eurypterids and aquatic scorpions lived side by side. It would seem that both of these lines of arthropods had a common ancestor from which the two lines split sometime during the Early Silurian. Gigantism in arthropods had its limitations and disadvantages. It made these animals less capable of supporting their huge bodies with their spindly limbs and probably restricted their radiation to watery habitats. 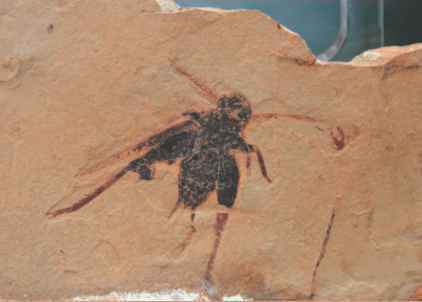 By the Carboniferous Period, formidable—but much smaller—land scorpions are found in the fossil record for the first time. Some of these appear virtually identical to extant species. They range in size up to about 4.5 inches (12 cm) long. Sometime during the Devonian Period, these scorpions developed stronger legs for walking, discarded their gills for a gasexchange respiratory system similar to that seen in insects, and moved to terrestrial habitats as respectable predatory creatures. Fossils of Late Paleozoic land scorpions are best known from deposits in Illinois, New York, England, Scotland, and the Czech Republic.